Kookaburras are a member of the kingfisher family, native to Australia. Although not native to Tasmania, they are common through many areas of the state, and are easily identified by their `laughing' song. 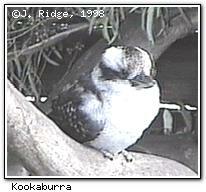 Kookaburras generally feed off small animals such as lizards.